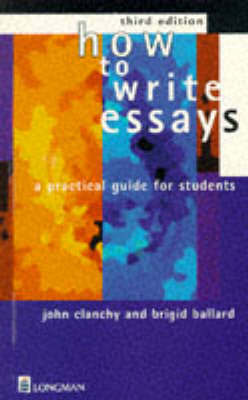 How to Write Essays, now in its third edition, has preserved the original serious, yet practical, approach to academic writing, with particular attention paid to the central tasks of analysing a topic, reading and research, planning and drafting, and editing the final version of an essay or report. *A new chapter on the use of the Internet and the WWW for essay and assignment research. *Chapters on book reviews, lab reports and fieldwork reports to make the book as relevant to Science students as it is to Social Science and Humanities students. *Numerous examples and exercises to provide practice in note-taking, essay planning, reading and editing strategies.